Ideal for use in a warehouse as well as small office, home, shipping & receiving, spot-checking andmore. Large 1″ Backlit LCD Display is easy to read from a distance. Comes with an extra-long 6′ Cord so you can hand the LCD Display & controls on a wall (with the included hanging-brackets), or can also be set on a table for easy-viewing. Controls are easy-to-use & have full Tare, Zero & Hold functions that are key functions for many users. Uses Bluetooth technoloy allowing you to have a wireless indicator. Large 750 lb capacity, 0.2 lb resolution. PD-750L is one tough scale! Designed with the heavy-duty user in mind, this scale is RS-232 ready (meaning you can use this scale in conjunction with the UPS WorldShip Program and other shipping software). The PD-750L can be operated with the included AC Adaptor or optional AA Batteries, allowing for flexibility & freedom of movement. 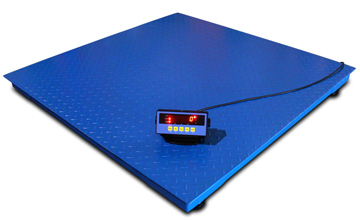 Due to its commercial heavy-duty design & underpinnings, it's also perfect for use in commercial locations as a weighing-scale. Digital Counting Scale -13 lb. 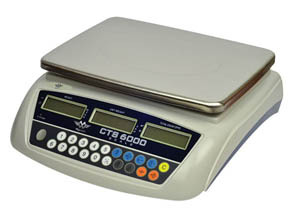 Digital Counting Scale - 66 lb.